Save $50 on Your Holiday Feast & Make it Look like you Hired a Chef! I’ve been cooking up another project for the holidays. Iâ€™ve put together this simple holiday entertaining guide to help you be the best hostess or guest during this holiday season. This guide is the antidote to every other holiday entertaining guide out there. And itâ€™s packed with the same help and love you get from $5 Dinners everyday. Plus there are 30 recipes for every aspect of your meal…free printable planners, free holiday sweet treats printable, and much more! 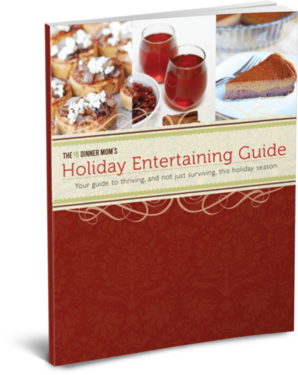 If you are interested in purchasing my Holiday Entertaining Guide, head on over to learn more! Also, you can get it for 50% off with the coupon code THANKS. This entry was posted in Recipe, Tips and Tricks. Bookmark the permalink. 2 Responses to Save $50 on Your Holiday Feast & Make it Look like you Hired a Chef! 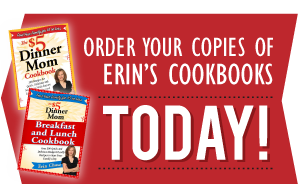 I just want to say I am reading your book $5 Dinner Mom Cookbook, and I love it. I already have implemented many of your tips into my shopping … they were a nice compliment to the things in the book I was already doing. Thank you so much for organizing this in a way it’s easy to wrap my brain around, lol. One more thing … I was wondering do you know where one can find a site or do you have this somewhere on your site where I could type in the meals I plan to make for say the week, and then figure what one already has in their cupboards, and then print out a shopping list of the remaining items that you don’t have? Just wondering… that would be helpful if you planned out some meals, made the list for say 7 days at a time. I don’t know … maybe you would have to have a primary list of things one should already have, or get to begin with (for starters) — and go from there. You could try a site like Ziplist or Food on the Table. Both are customizable meal planning services. Ziplist requires an account, but it’s free. Food on the Table has a limited free version, and unlimited paid version.